Two new studies are showing that viral infections are possible owing to a remarkable biological phase transition. The research shows that viral DNA transforms from a glassy solid to a fluid-like state when the conditions for infection are just right. The new insight could result in new antiviral therapies. The DNA that's tightly packed inside a virus's protein shell is denser than what's found in the nucleus of a human cell. Because of this tight packing, the genetic chain can barely budge. But as we know, infections most certainly do happen. 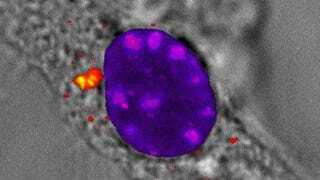 Viruses somehow inject their DNA into the host cell at high speed. But how? How can the frozen and highly pressurized DNA suddenly become liquid enough for this to happen? Well, it's because the DNA does become liquid enough for this to happen. "The exciting part of this is that the physical properties of packaged DNA play a very important role in the spread of a viral infection, and those properties are universal," noted Evilevitch in a Carnegie Mellon statement. "This could lead to a therapy that isn't linked to the virus' gene sequence or protein structure, which would make developing resistance to the therapy highly unlikely." Indeed, the new insight could provide a promising new target for antiviral therapies. For the bacteriophage lambda, which infects Escherichia coli bacteria in the human gut, the researchers studied the compressibility of the DNA using atomic force microscopy, and the energy released upon injection as a function of temperature. They found that the tightly-packed DNA melts and becomes sufficiently mobile for injection as the temperature approaches human body temperature, around 37°C. In a separate study on Herpes simplex virus type 1, which can reside in human cells for long periods and injects its DNA into the nucleus when it awakens, the Evilevitch group found that the ionic conditions in the cytoplasm of the host cell, as well as temperature, are key factors that determine when the DNA is liquefied in preparation for injection. Fascinatingly, DNA maintains its solid-like state when the conditions are not ideal for infection, thus stabilizing the virus particle and ensuring that its DNA isn't ejected at the wrong time. It's here where therapists are going to look when devising their antiviral therapies. Read the studies at PNAS: "Solid-to-fluid–like DNA transition in viruses facilitates infection" and Nature Chemical Biology, "Solid-to-fluid DNA transition inside HSV-1 capsid close to the temperature of infection." Supplementary information via Carnegie Mellon University and Chemistry World.